- A film adaptation of this book was released on May 15, 2009 that will serve as the prequel of the hit movie Da Vinci Code. 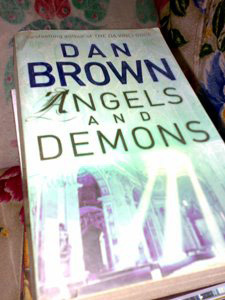 Dan Brown's works received their renown when he published his second Langdon thriller, The Da Vinci Code. Angels & Demons is the book that started the ingenuity of his work, although this is his lesser-yet-still-appreciated work. This book tackles not-so-dangerous "waters" compared to that of Da Vinci Code's, so I guess despite its still enjoyable thrill it didn't achieve the level of fame achieved by its sequel, which caused uproars to some sectors. "When world-renowned Harvard symbologist Robert Langdon is summoned to a Swiss research facility to analyze a mysterious symbol -- seared into the chest of a murdered physicist -- he discovers evidence of the unimaginable: the resurgence of an ancient secret brotherhood known as the Illuminati... the most powerful underground organization ever to walk the earth. The Illuminati has surfaced from the shadows to carry out the final phase of its legendary vendetta against its most hated enemy... the Catholic Church. An explosive international thriller, ANGELS & DEMONS careens from enlightening epiphanies to dark truths as the battle between science and religion turns to war..."